Please, get badges for all personnel who will attend the show on registration desk. These exhibitor passes are valid during the buildup, dismantling period and exhibition days. Work passes (which are not valid during the Exhibition) will be issued by ECC “Sokolniki” to all personnel involved in the setup and dismantling of free design booth. To receive these passes upon arrival you need to present to Service Center 2 copies of letter requesting for the work passes and listing the names, nationalities and passport numbers of the set- up personnel. The letter should be submitted to the “Sokolniki” General Contractor for approval. These passes must be worn all the time. The security guards have strict orders to refuse entry to any personnel not showing the pass. The vehicles entry to the venue during the Exhibition is charged, the fee is to be paid at the gate of the checkpoint. Exhibitors with the Raw space site or their contractors should pass the procedure of a technical expertise with the General Contractor of ECC “Sokolniki”. The entry on a light vehicle is allowed only after 17:00 on the last day of the Exhibition. The Organizer is unable to provide storage facilities onsite for packing cases, surplus materials or other properties of the Exhibitor. Prior arrangements for safekeeping must be made with the official lifting and handling Contractor. The fine will be issued in case of noncompliance. The loading and uploading of goods and handling all the cargoes on the territory of the exhibition venue shall be performed by the General Contractor of the ECC «Sokolniki» only. The entry to the territory of the ECC «Sokolniki» for loading and uploading the goods on special heavy-duty vehicles is strictly forbidden. Columns, pillars, fire points switchboards and utility connection points may not be always conveniently located with regards to your booth location. This may result in longer lengths cables and pips being visible; kindly take it into consideration with understanding. 1,5 kWt electricity connection and supply, sockets and spotlights are included in the Standard Package, as per the schemes for standard package. Additional electrical equipment can be ordered in section "Service". Should you order refrigerator, a 24 hours plug socket 220 V to be ordered additionally. Should you have exhibits, power consuming equipment or powerful lighting items requiring more electrical capacity, please, submit the application for the same, please, refer in section "Service". Exhibitors are obliged to order enough electrical capacity for their booth. Exhibitors undertake the responsibility for any damage to electrical networks being done due to incorrect information about maximum capacity of equipment at the booth. 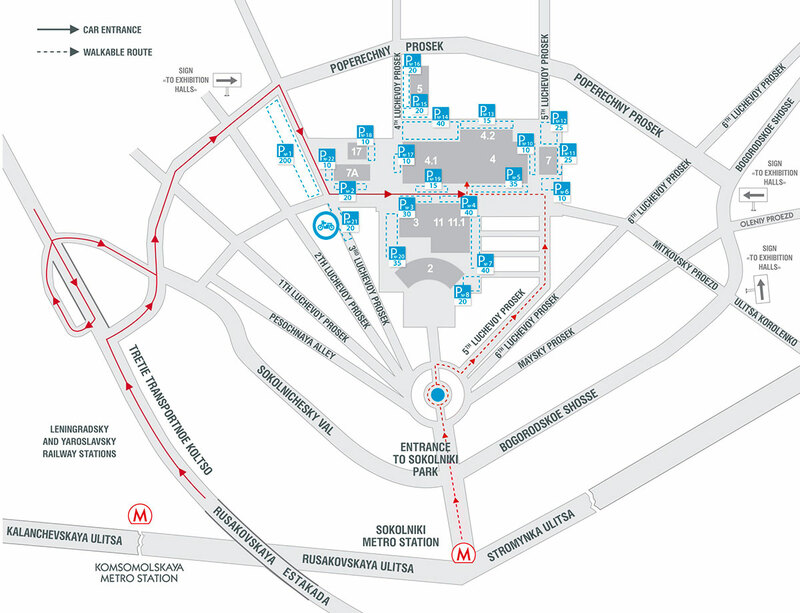 All electrical connections to the main power source for standard booths must be carried out by the General Contractor of the ECC «Sokolniki». installations can be in charge. Electrical installations and maintenance of the equipment at exhibitors' booths can be carried out only by persons complying with the professional requirements and qualifications according to electrical safety standards (corresponding to the 3 or higher grade of rd Russian electrical safety standard). The supply cable for 380/220Wleading to device (power panel) of the exposition booth must be made of five core cable. The lines of single – phased electric wiring must be made of triple-core cable. The use of four – core cable is permitted if the copper thread section is not less than 10mm. The length of the cable may vary depending on the switch point location. Exhibitors with the raw space only sites or their stand builders have to provide their own switchbox and cabling to the main suppliers. The stand hardware must be grounded according to the regulations of work of electric systems (RWES). All stands must be equipped with power panels with RSD (residual current protective device) according to RWES requirements and with proper design load of extra current and protective devices installed separately for lighting networks and the power supply for equipment, as well as equipment that demands 24 hour electrical supply (such as machines, refrigerators, etc.). The General Contractor of the ECC «Sokolniki» can supply an electric switch board with RSD on a commercial basis for the time of Exhibition. The representative of the power center of the General Contractor of the ECC «Sokolniki» will link the booths main distribution box to the main source of power. The use of electrical equipment such as lamps with tungsten iodide, lamps of high pressure and electric stoves is strictly prohibited. It is prohibited to exceed the amount of power ordered. All temporary electrical wiring used during the stand construction must conform to established instructions. No flashing lights or signage will be permitted. Exhibitors that need to use their own switch boxes because of functional or aesthetic reasons will be charged for connection to the main switch box of the hall. No electrical installation may be suspended form the roof of the exhibition premises or fixed to any part of building structure. No fittings may project beyond the raw space allocated. The Organizer reserves the right to disconnect the supply of any installation which, in the opinion of the electrical consultant is dangerous or likely to cause annoyance toVisitors or other Exhibitors. The electricity supply will be provided to the booth only for the time of Exhibition. During the set up and dismantling period you are advised to use the temporary plug sockets in the Pavilion. All the Standard Package booths are built using Octanorm or other identical systems: white light plastic wall panels joined bymeans of aluminumpoles and beams.The overall size of a standardwall panel is – 2360 x 970mm. For the description of Standard Package Booths of different sizes fitting, please, refer to the Form T2a of the Manual. For additional furniture and equipment, please, apply through in section "EQUIPMENT". Please, ensure, that you do not order the equipment already included in the Standard Package twice. No money will be remitted in case of an order refusal. The piece of furniture and equipment not depicted on the sketch will not be delivered to your booth. Set of furniture included in the Standard Package cannot be replaced with any other items; the money for the unused equipment is not refundable. Kindly note, a surcharge 50%will be applied to all the orders placed after the 17 October 2016. Asurcharge 100% will be applied to all the orders placed during the buildup or during the Exhibition. The wall panels and other booth equipment must be returned after the Exhibition without any damage. The cost of repair or replacement of damaged pavilion facilities will be charged to the Exhibitor. · No additional stand fitting or display may be attached to the shell booth structure; no nailing or drilling is allowed. · No painting or wallpapering on the shell stand panels is allowed. Exhibitors who wish to have the panels printed must order this service in advance from the Organizer, please, refer in section "Service". · No freestanding element may exceed the height of 2,5 meters or extend beyond the boundaries of the allotted space without approval of the Organizer. For the signage on the fascia board and other graphic works, please, fill in section "Service". The electrical equipment included in the Standard package is placed along the opened sides of a booth. Should you want it to be replaced deeper inside, it is to be paid separately. 1. Minimum width of gangway in the exhibition hall is 3 meters and main gangway is 4 meters. The width of the gangway facing open booths on the four sides of the exhibition hall is 2,5 meters. 2. The gangways, ails and exits must be kept vacant all the times. Unneeded transportation craters, package and other materials and equipment must be removed from the Pavilions immediately. 3. All the trash and unneeded building materials to be thrown to trash containers outdoor before 20:00 on the last day of buildup. 4. There free access to structural actuator accesses, electrical boards, firefighting closets and all other means on firefighting. 5. Flammable, explosive, radioactive and poisonous products must not be stored, used or displayed in the Exhibition halls. 6. All the materials used in the construction of a stand must be nonflammable or fireproof. All flammable materials must be treated with a fireproofing compound. 1.To conduct any sawing, planning and other carpentry works related to the booth construction. 2.To conduct any painting works by spraying. 3.To apply any painting, polish or glue on the floor, walls, pillars in the pavilions. 4.To drill the floor, walls, pillars of the. 5. To exceed a volume level of 75 decibels at the stand boundary. Please be advised that the Organizer and the Venue management reserve the right to switch off the noise source and to impose penalty should the noisemaker ignores the previous notice. All plans and dimensional drawings for raw space exhibits for construction on one's own or with an outside Contractor must be presented for coordination and approval to the General Contractor of ECC «Sokolniki». As the Official Contractor involved and the General Contractor of the ECC «Sokolniki» carry out obligation to assure the conformity of the technical stand construction documentation to the requirements of the “General Terms of Participation” established by the ECC «Sokolniki». The General Contractor of ECC «Sokolniki» controls the quality of all the electro assembly by the Exhibitors or by their outside Contractors. All the raw space contractors must possess fire certificates issued by the producer of the material in Russian that prove that all booth materials to be used are non-flammable or fire- resistant/flame proof. These certificates must be on hand at any time during the exhibition period. Every stand will be inspected by an officer from the Fire Station to confirm the compliance to all fire regulations. If any stand is found to be in violation of the fire regulation, the installation of the stand or participation in the exhibition will be suspended. You should provide us with booth printing scheme which panels are to be printed. If you want to have printed panels which are not included in your booth package , you should order additional printing in section "Service". You should provide us with print layouts for each panel. Size should correspond to panel size , including invisible area. Linked color profiles will be ignored. If you provide not TIFF files for printing, it elevates the risk of incorrect image reproduction. Resolution more than 72 dpi can’t improve printing quality. All files before printing are to be transformed to files with resolution 72 dpi. Colour model must be CMYK. Files with other colour models are to be transformed inCMYKautomatically that leads to incorrect colour tones while printing as usual. Don't place any important element on your printing closer than 20 mm from picture edge. STANDARD booths have invisible 10mmfrom each side. If you are going to place one big picture on several adjoining panels, please, contact us to get real sizes for this kind of printing.The same thing is for printing on information desks, doors, counters, cases and so on. Don't delay the deadline . While checking files any problem can occur and we need time to correct it. Besides, surcharges of 50% or 100% will be applied to all orders submitted after October 10. Please, indicate your Company name and panel number in file name only by Latin letters.